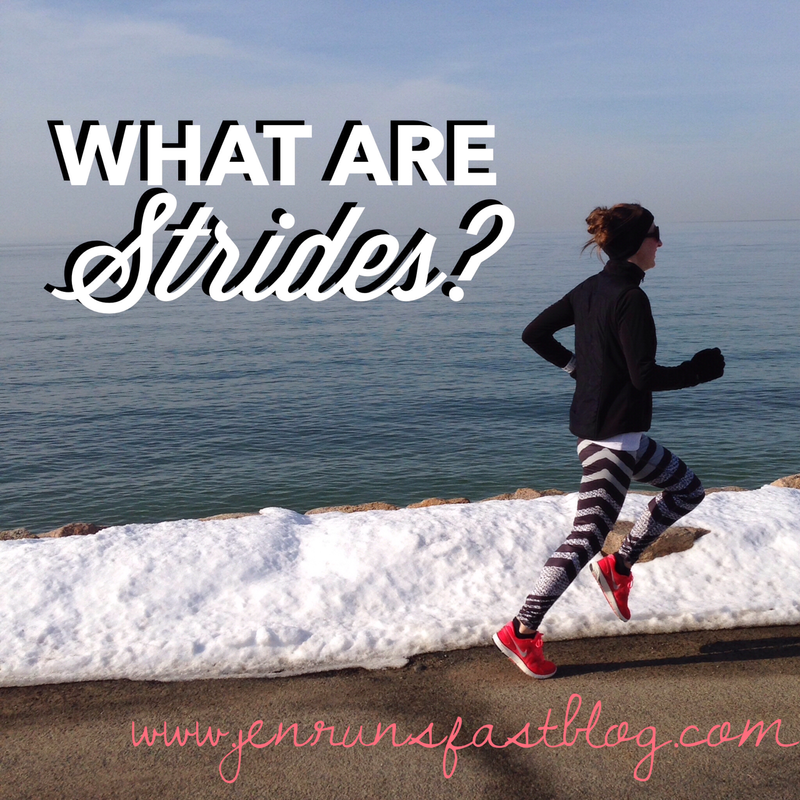 Run Jen Run: Beginner Blog: What are Strides? Strides are short bursts of running fast(er). Every runner has different goals and different training plans but I normally recommend adding between 4-10 strides 1-3 days per week for about 40-100 meters, depending on the day. Strides can take the length of the straightaway of a track, the distance between two houses, etc. Be creative! Strides are not meant to be an anaerobic workout so leave plenty of time in between for recovery by jogging, walking or even standing around in between repetitions. Strides teach the body how to run faster. They are an excellent way to work on the fast twitch muscle fibers to increase speed while promoting good running form. How fast should you be running strides? The Road Runners Club of America (RRCA) recommends running strides at “submaximal pace with occasional moments at maximal pace.” You can think of submaximal pace as running somewhere between 10k pace and half marathon pace. I say just run faster than your normal training run pace at a controlled pace. Stay relaxed and focus on form. Start slow and work up to a faster pace by the end of the stride length. You can also progress through your stride repetitions and try to make each stride repetition a little faster than the last. Don’t worry about timing yourself though. It’s all about feel. These are informal. Remember the goal and purpose of strides. 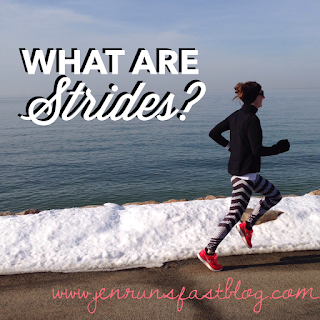 Strides are great before a workout, in the middle of a run and at the end of your run. Add strides after your pre-workout routine. Recommended sequence of events: warm up jog, drills, strides, workout, cool down. This will help get your legs ready to run fast so you can dominate your workout. Add a few informal strides to the middle of your run as an instant pick-me-up! We all have bad, flat runs. Sometimes all we need is a few short burst of energy to get those legs into a good, comfortable rhythm. They are also beneficial mid-run to simulate race scenerios: speeding up to pass another runner or slowing down and speeding up at a water stop. Add strides at the end of your run especially on slower, conversation pace run and on longer run days. When you’ve been running at a constant, slower pace, strides will remind your legs what it’s like to run fast. By the end of a long run your form may be suffering so throw in some faster bursts and concentrate on good running form: high knees, upper body relaxed, arm swing, breathing, cadence, etc. Strides after a run are also great to practice that end of race feeling of trying to pick up your pace in the final stretch to the finish line!